Recognising that the Pilbara, the Kimberley and north west regions of Western Australia hold significant potential for the development of irrigation under centre pivot or lateral move equipment Upton Engineering the Corowa NSW based manufacturer has appointed the Geraldton based branch of long established agricultural machinery and services group McIntosh & Son as a full line distributor responsible for sales, installation, servicing and with a stock of all consumable parts. McIntosh’s Geraldton branch manager Brad Forrester says he sought out the appointment from Upton Engineering for their full range of the Australian made Upton aluminium and the US Pierce range of galvanized steel centre pivot and lateral move irrigators. “The irrigators have been supplied by Upton Irrigation to be used as part of a value adding cattle fattening and finishing operation” Brad Forrester says. Upton Irrigation and the McIntosh & Son Geraldton branch will also be working together for a further installation at Wallal Station north of Port Hedland including two Pierce centre pivots each watering forty seven hectares. This installation will be completed in coming weeks. Brad Forrester says that Upton Engineering as a second and third generation family owned company is one of the best known and longest established manufacturers and suppliers of high technology irrigation. Founded in Corowa in 1944 the Upton record shows towards 600 irrigators installed and managing director Paul Upton says that his company has succeeded from a focus on high design inputs, advanced state of the art manufacturing and an emphasis on customer service. Brad Forester adds “our Geraldton staff that will specialise in irrigation have recently completed a technical induction course and a visit to the Upton headquarters in Corowa NSW. “We see significant potential for both Upton and Pierce machines throughout the north west of WA as station property owners in particular see the potential for finishing their stock on irrigated grass pastures. “There is also significant scope for irrigated crops to take advantage of the available water resources and McIntosh & Son consider irrigated agriculture will be a significant growth opportunity for the future. “Like Upton’s McIntosh & Son is a long established WA agricultural machinery and services business having recently recorded our sixtieth year of operation. “We have eight retail stores in WA, another in Queensland with long established relationship with leading brands like New Holland and Geraldton is our most northern branch in WA. “It is uniquely placed to service the anticipated expansion of centre pivot and lateral move irrigation in the north west of WA”. McIntosh & Son has appointed Glen Mackin with irrigation sales responsibility throughout the north west while Scott Hughes will head up service, parts and technical support from the Geraldton branch. Upton Engineering manufactures its own branded range of aluminium centre pivot and is also the Australia stocking distributor for the Pierce range. With head office in Oregon USA and active around the world the Pierce pivot and lateral move range of irrigators offers galvanized steel or poly lined pipe work making these machine an ideal choice for applications where poorer water quality may be an issue. For More Information: contact Brad Forrester at McIntosh & Son Geraldton on 0428 215 003 or 089921 5000 or Paul Upton, Upton Engineering Corowa NSW on 02 6033 1844 or 0417 459 180. Brad Forrester Branch Manager of McIntosh & Son Geraldton WA and his support staff have recently completed a technical and product induction on Upton and Pierce centre pivot and lateral move irrigation products at the Upton Engineering headquarters at Corowa NSW. 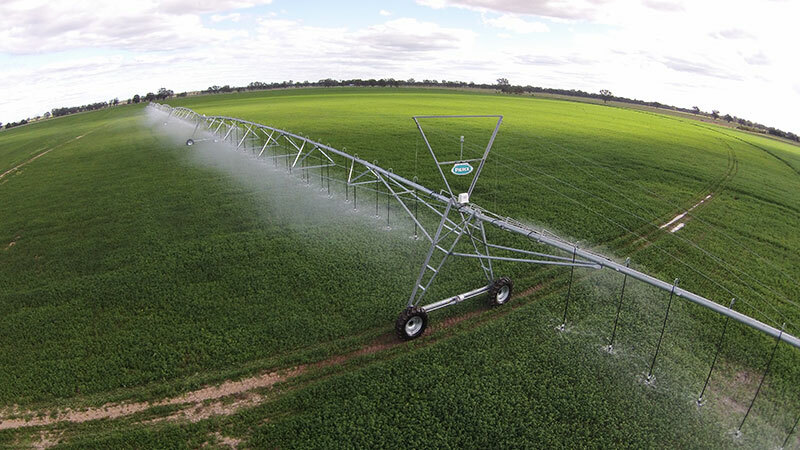 McIntosh & Son has completed their first installation and commissioning of four Upton centre pivots each watering 40 hectares at Brent Smoothy’s cattle finishing operation at Eneabba. This project is to be followed by two more Pierce centre pivot s to be installed at Wallal Station north of Port Hedland. The McIntosh & Son Geraldton Branch will supply, install and service the Upton and Pierce irrigation ranges throughout the north west of WA.